The Georgetown Hoyas (22-7, 12-6 Big East) begin Big East Tournament play tomorrow at 2 PM, when they play the Pittsburgh Panthers (17-15, 5-13) at Madison Square Garden. The Panthers come in after walloping St. John’s this afternoon, 73-59. Senior guard Ashton Gibbs led the team with 20 points while Nasir Robinson chipped in 15 points to go along with 8 rebounds. Over the weekend, senior guard Jason Clark was named to the All-Big East First Team while classmate Henry Sims was recognized for his turnaround this season, as he was named to the Third Team. Junior guard Hollis Thompson was named Honorable Mention. The senior was proud of his accomplishment but in his own, selfless manner, deflected the attention towards the team. His coach, John Thompson III, was very proud of Clark and Sims’ efforts as well, focusing in on Jason’s contributions to the team. 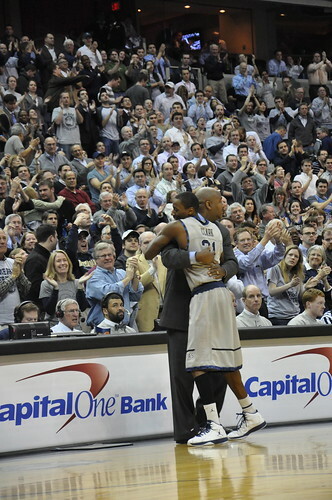 In addition, Clark was awarded the Big East Sportsmanship Award, a testament to his peers’ perception of Clark. The guard did not hear about the award until reporters mentioned it to him yesterday, but was honored by the distinction. Not everything went as expected for the Hoyas, though, as freshman Otto Porter was not named to the All-Big East Rookie Team. Porter leads the Hoyas in rebounding this season and has played his best in Georgetown’s biggest games. Still, Porter remains humble and simply wants to acknowledge the snub through his play this week. The Hoyas are coming off a disappointing loss to Marquette on Saturday. With a win, the team would have secured the two seed in the Big East and a double bye. Instead, the 83-69 loss dropped the Hoyas to a five seed, leaving them with only a single-game bye. Clark acknowledged that the loss was upsetting but says his team has turned the page from the defeat. Aside from Marquette senior Jae Crowder’s stellar performance, the Hoyas were done in by an inability to counter the Golden Eagles full-court press. In all, they committed 14 turnovers but the press stagnated their offense and never allowed them to mount a comeback as they did in the teams’ first meeting back in January. Thompson said it is something they have stressed in practice when speaking with reporters on Monday. As for preparing for the tournament, the coach stressed that the team’s approach has to be different, as teams only find out their opponent about 24 hours before tipoff. 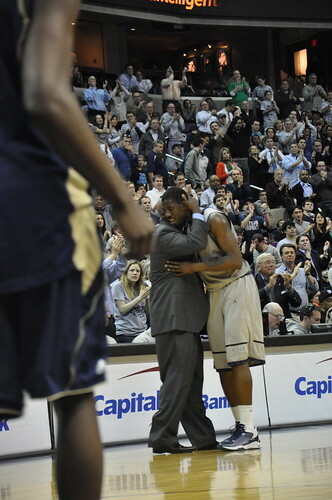 The Hoyas also have a bit of a vendetta, as the Panthers beat Georgetown in Pittsburgh earlier this season. At that time, the Panthers were just getting used to having point guard Tray Woodall back in their lineup, making them all the more dangerous now that they’ve adjusted to his return. Sims expressed frustration with that game against Pittsburgh, but vowed the Hoyas would come out focused if given another shot at the Panthers. Clark echoed his teammates’ sentiments but indicated that his Hoyas are in for a battle on Wednesday afternoon.